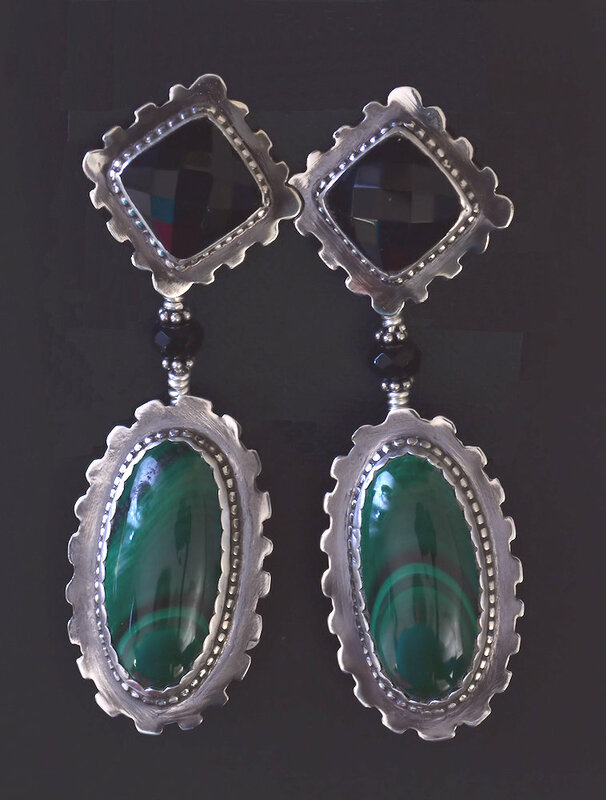 Huge, luscious high-domed Malachite dangles below faceted cushions of Black Onyx. Malachite sometimes seems a little... well ... green for my taste. It's swirling patterns are gorgeous, green is one of my favorite colors, what is my problem? Despite my bias against using this fabulous stone, these stones spoke to me, I couldn't resist them. Malachite occurs world wide from Russia to Africa to Arizona. It's a copper mineral and was mined for copper for 3,000 years in Israel. It has been used as pigment, as an ornamental stone and as a gemstone. One thinks immediately of the Hermitage in Russia with its Malachite room and the enormous Catherine de Medici Malachite vase which from photos appears to be about 12' high. According to Wiki, the name Malachite comes from the Greek meaning "mallow" because of its resemblance to that plant. That sounded strange to me since plants are, for the most part, green. Why mallow? It's curious that the mallow is one of the earliest plants cited in literature, Horace mentions it. Perhaps at one time it served as a more generic term for green herbs so came to mind in relation to this lovely material. 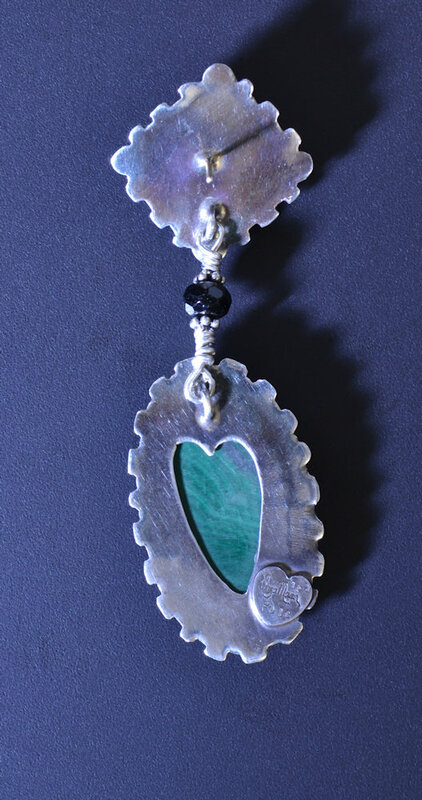 Simmons says, "Malachite is one of the most important stones for protection from negative energies." Maybe he is right: these earrings make me feel happy with their movement and blending of colors. 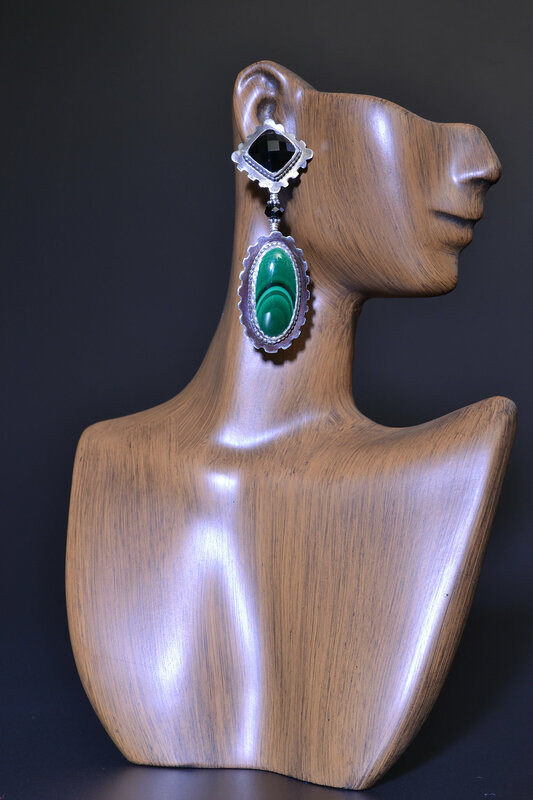 The faceted Black Onyx picks up the dark swirls in the Malachite; the Malachite makes a lovely spot of color around the face. I think you might like these... Please note the weight, they are a little heavier than most of my earrings.